Adam B., 34, has been an avid collector of action hero figures and movie memorabilia since childhood. Posters of classic horror films cover nearly every inch of the walls of his bedroom, and Superman, Batman, and Spiderman battle for the rights to become the most dominant action figure on his bookshelves. Adam and his BAYADA Nurse Brandi Lapadula, RN, are having an animated discussion on which superhero rules. Brandi is partial to Superman, but for Adam, it’s no contest—Batman is the best. “The nurses are so friendly and really relate to him. 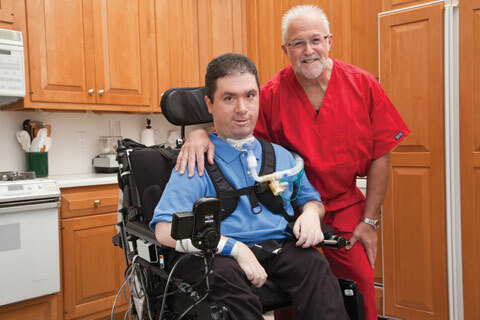 They share his sense of humor, his likes and dislikes,” says Adam’s mother Margie, who deeply appreciates the nursing care from BAYADA for Adam and his brother Danny, 31, who are both living with Duchenne muscular dystrophy. An inherited disorder, Duchenne involves rapidly worsening muscle weakness. Symptoms usually appear before age six and include fatigue, muscle weakness in the legs and pelvis, difficulty with motor skills, frequent falls, and progressive difficulty walking. Eventually this muscle weakness spreads to the arms, neck, and other areas of the body, leading to difficulty breathing and paralysis. Danny, who also had cerebral palsy, was diagnosed with Duchenne at 9 months. Margie feared her older son might have the same disorder when, at three years old, Adam had trouble riding his big wheel and keeping up with other kids his age. 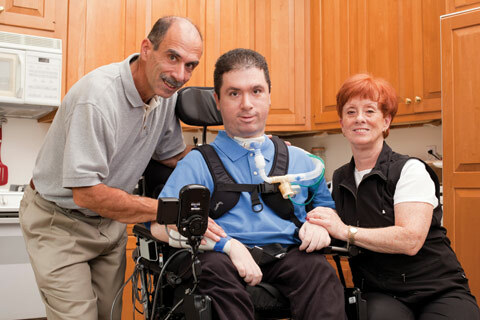 Today, Adam’s ability to move is limited to his thumbs, which he uses to manipulate his wheelchair and to operate the computer. “I’ve used a wheelchair since the age of six. My disease has progressed to the point where I need a tracheostomy tube and a ventilator to breath 24 hours a day,” shares Adam, who has not let his disability distract from his passion for the arts. He has several college courses under his belt, including Introduction to Music, Introduction to Art, American Cinema, and Introduction to Theater. With the help of his family and close friends, he realized his dream of making his own movie, a satirical docudrama based on his experiences as a person with a disability. Indeed, knowing that her sons were in good hands allowed Margie the freedom to pursue her career as a field representative for a merchandising company. What’s more, they made sure both Adam and Danny had 24-hour care so that she and Bob were able to take a long overdue vacation together. Margie and Bob are deeply grateful to all of Adam and Danny’s nurses, including Brandi, William Burke, LPN, Alice Czaja, RN, Rachel Gotshall, RN, Lindsey Lawyer, RN, Denise Martens, RN, Kathy McCarty, LPN, Latasha Nickson, LPN, Barbara Simensen, RN, Patrick Smith, RN, and Lilah Spadafora, RN. “If there is ever an emergency, BAYADA is always just a phone call away,” she says. And when we needed help with our insurance, the office staff stepped in, working tirelessly with the insurance company to make sure we got the coverage we needed. 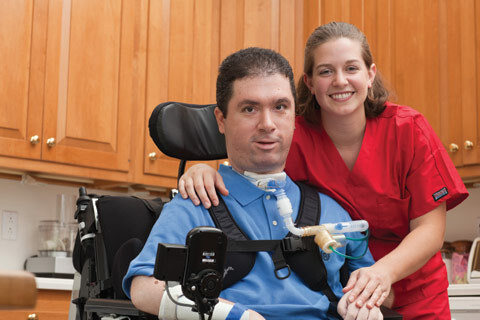 Brandi, who came to BAYADA after working on a hospital medical/surgical unit, has provided care for Adam for over a year. For Margie, Bob, Danny, and Adam, the nurses have become so much more than caregivers, they have become good friends. For additional resources on muscular dystrophy, visit the Muscular Dystrophy Association. To learn more about BAYADA Home Health Care, click here, or call 888-4-BAYADA.